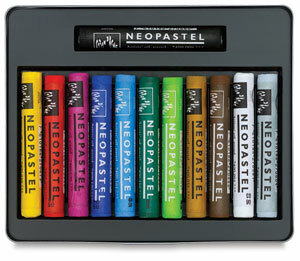 Pastels are available in several types: hard, soft, oil, PanPastels, and pastel pencils - each with their own unique characteristics. This article will give you an overview of pastels so that you know what to consider when making a purchase. If you want to skip the introduction and see which brands I recommend, you can go straight to pastel types. I love making art with pastels because they produce brilliant colors and you can just dive right in without needing paintbrushes, solvents or a palette. All you really need to get started are some pastel sticks, a sheet of paper, and your fingers! No other medium allows you to apply rich color to the support as quickly as you can with pastels. 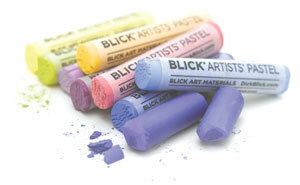 Pastels are made by mixing dry pigment, some chalk, and a binder together to form a thick paste. The paste is fashioned into sticks and allowed to dry. (If you want to see an overview of the process, check out my post on The Art Colony: How to Make Your Own Soft Pastels from Scratch.) 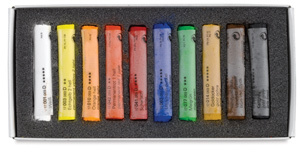 Because they are almost pure pigment, pastels produce intense colors that most other media can't match. Despite their simplicity, pastels are very versatile. 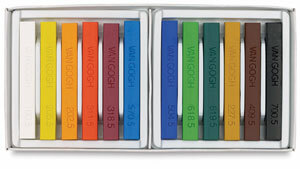 As you'll see below, there are five main types of pastels that are capable of a variety of techniques and effects. 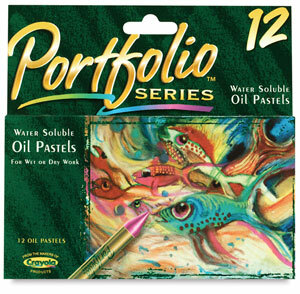 Soft and oil pastels have a buttery or waxy texture that is well suited to painterly effects. When you cover the entire surface of the support with pastels it's called a pastel painting. 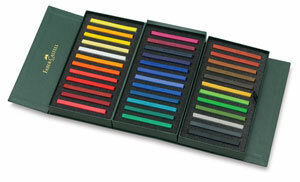 You can also get harder pastels that are suited to drawing, sketching and precise detail work. When parts of the support show through, it's typically referred to as a pastel drawing. This versatility means that you can use pastels for all kinds of subjects and genres. My photorealist painting of the stuffed animal above left was created entirely with pastels. As was my stylized portrait on the right and my landscape painting below. One of my favorite applications for pastels is sidewalk chalk drawings. I attend a sidewalk art festival every year and am always inspired and amazed by the creativity and ingenuity of pavement artists. 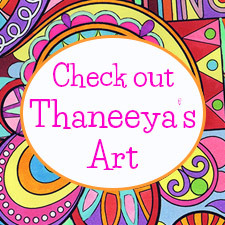 If you like to start practicing with pastels check out my how to use pastels tutorial. For now, lets look at quality, colors, safety and pastel types. 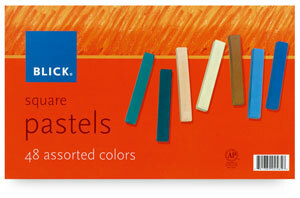 You can buy pastels in two main grades: artists' quality and students' quality. 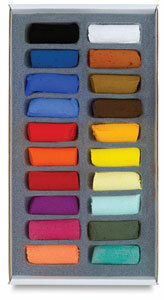 Artists' quality pastels contain the best pigments available and a higher ratio of pigment to binder. This means that artists' colors are stronger and more intense. They also have high permanence ratings, which means that they won't fade over time. 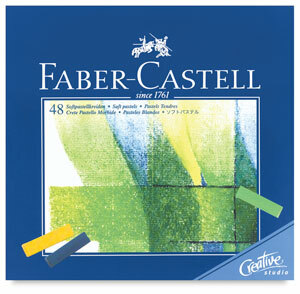 Students' quality pastels are much cheaper but usually contain cheaper pigments. They'll also contain more filler and binder, which means the colors won't be as intense, but they won't crumble as easily as artists' quality pastels. 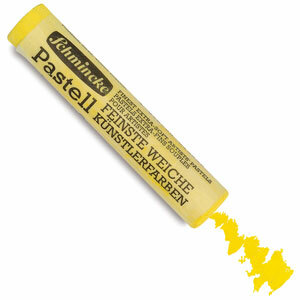 Because they contain such high levels of pigment, pastels can be expensive. But after the initial cost of buying a range of colors, it's not too expensive to buy additional pastels individually when needed. If you'd like to experiment with pastels but aren't yet willing to invest in artists' colors, I'd recommend you buy a cheap students' set. It's better to just start making art with whatever supplies you can afford, but if you're serious about pastel painting and drawing you'll eventually need to buy artists' quality pastels. You'll really notice the difference! Pastel colors can be blended together but they don't mix nearly as well as paint. To compensate for this, pastel manufacturers offer a huge range of colors. Pastels can be purchased in sets or individually. 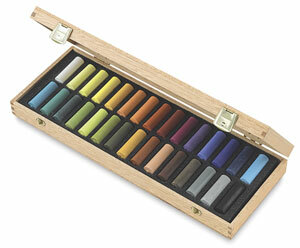 If you're just starting out you first need to choose which type of pastels you want to buy. 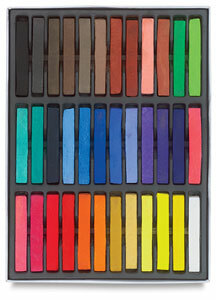 If you're not sure, start off by buying your pastels individually which will keep costs down. Once you know which type you really want to invest in, you can think about buying a set containing a good starter palette of colors or you can select your own custom range of colors. Some artists' colors are more expensive than others because certain pigments are rare or expensive to mine. 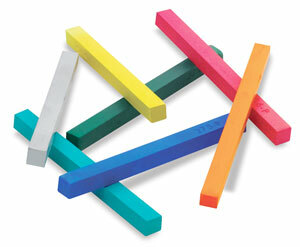 Students' quality pastels may contain stand-in pigments which mimic the color of costlier natural pigments. If a cheaper pigment is used as a substitute it will have the word "hue" after the pigment name. When using soft pastels you need to be mindful that they often deposit fine dust into the air which you can easily inhale into your lungs. There are now non-toxic pastels availble, but it's wise to take steps to avoid breathing in pastel dust. Some artists wear face masks, but I find them very uncomfortable. When the weather permits I like to work outside. Failing that, I'll work in a well ventilated room. I recently purchased an air purifier which makes pastel painting safer (and also relieves my husband's allergies). 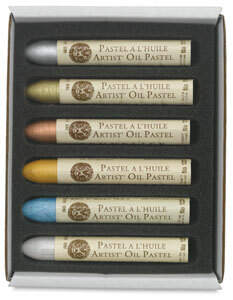 There are five main types of pastels: soft, PanPastel, hard, pencil, and oil. They are all essentially pigment in stick form (or pans), but they differ in how they're bound together. 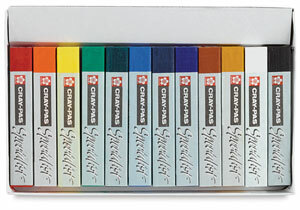 Soft pastels, hard pastels, and pastel pencils are all bound with a gum or resin binder which means that they're compatible with one another and can be used on the same painting or drawing. Oil pastels, on the other hand, are bound with oil and wax, which gives them a unique texture similar to oil paints, but it means they can't be mixed with the other pastel types. Let's take a closer look at each one: Soft Pastels, Pan Pastels, Hard Pastels, Pastel Pencils, and Oil Pastels. Soft pastels are the traditional form of pastels and also the most used. They have a very high concentration of pigment that is held together by the least amount of gum binder as possible. As a result, they crumble very easily, but their colors are wonderfuly intense. This fragile consistency and powdery texture makes them well suited to blending, layering on lots of color, and for painterly effects. You can also use the edges for fine lines, but most artists use hard pastels or pastel pencils for detail work and preliminary sketches. Soft pastels come in a wide range of colors - more than other pastel types - with some manufactuers offering up to 500 colors! 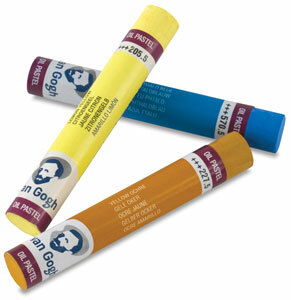 Soft pastels come in cylindrical sticks and a range of sizes: whole sticks, half sticks, and thick sticks. You can buy them individually, but if you're buying your first pastels it may be easier to buy a starter set with a balanced color palette that you can build on over time. Each manufacturer uses a slightly different formula which can affect the powdery texture and how easily they crumble. You may need to experiment to find a brand that best suits your style. 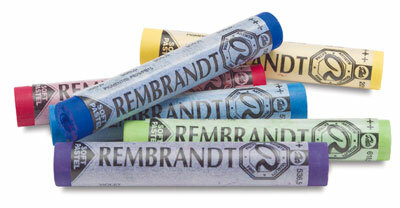 If you're looking for the very best, both Sennelier and Rembrandt soft pastels are consistently praised by artists. PanPastels are a form of soft pastels, but instead of being molded into sticks, they are set into pans or jars. This format allows for much less binder and probably the highest pigment concentration of any pastel product. 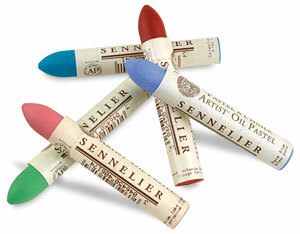 The packaging protects the pigment, reduces waste, and allows for easy storage and transport. 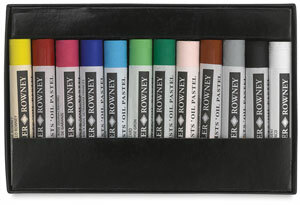 PanPastels are a relatively new format for pastels, but have gained a huge following. They appeal to artists because they can be lifted (with brushes, sponges and other tools) and applied to the support like paint. 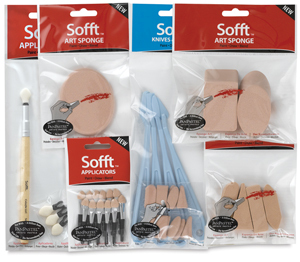 You can buy a whole range of specialized PanPastel applicators called "Sofft Tools" that allow for varying degrees of detail and different painterly effects. 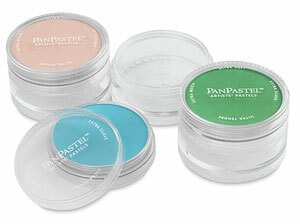 PanPastels are also popular because they're super easy to blend, they can be fully erased, and are compatible with other art mediums and surfaces. They're also cleaner to use and create much less dust than soft pastels. You can purchase them individually or select from of wide range of sets (see below). For more info on how to use PanPastels, check out the PanPastel resoures website, which contains instructional info and real-life examples from working artists. 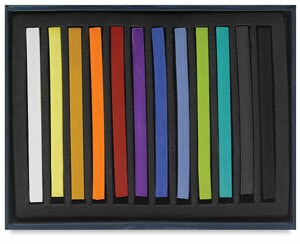 Hard pastels are made from the same ingredients as soft pastels, except they contain more binder and less pigment. This means that their colors are not as intense but they don't crumble or break as easily. Because they're more stable, hard pastels are especially suited to drawing techniques and working on location. They come in cylindrical or square sticks which can be sharpened with a knife to create fine lines. Alternatively, the sides of the sticks can be used for applying broad swaths of color. You can use hard pastels for an entire drawing, like I demonstrate in my pastels tutorial, but it's common for artists to use hard pastels in combination with soft pastels. They can be blended like soft pastels, and they're well suited to preliminary sketches, small details and finishing touches. 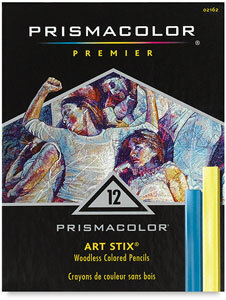 Hard pastels come in artists' and students' quality. If it doesn't specify which, it's probably just students' quality. There are fewer colors availble than for soft pastels, but more than enough. If you're trying decide between soft and hard pastels, it depends on the techniques you'd like to use. For complete beginners I'd recommend investing mostly in soft pastels to begin with. 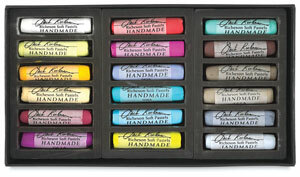 Buy a few individual hard pastels to try out and to use for sketching and small details. Pastel pencils are perfect if you're looking to create controlled, detailed works of art with pastel. They're just like conventional pencils, but encased within the wood is a thin stick of pastel that has a consistency in between hard and soft pastels. Pastel pencils are versatile enough to be used on their own but many artists also use them in combination with other pastel types (excluding oil pastels). They can be used dry or wet and can be blended just like other pastels. You can sharpen them to a point to create precise details or use them bluntly for soft, hazy lines. Many artists also use them for preliminary sketches, which is especially handy given that graphite pencils aren't compatible with pastels. I find them super convenient because they're not messy like soft pastels. You can easily create quick, spontaneous drawings with little preparation or clean up and still enjoy the pleasing qualities of pastels. For this reason they're well suited to outdoor work. Pastel pencils are viewed negatively by some artists who really love the dirty intimacy of applying pastels to the support with their bare hands. 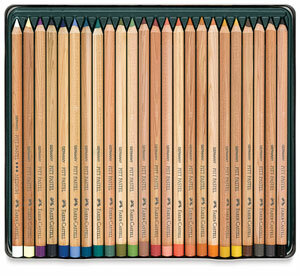 Most manufacturers offer about 80 pastel pencil colors which you can buy individually or in sets. I'd recommend you start off by purchasing a small selection of individual colors to experiment with. 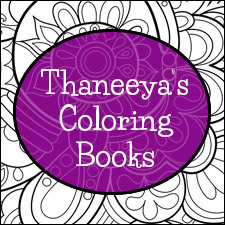 If you like the medium you can invest in a set with a wide range of colors or select your own. Quality varies between brands. Each pencil will cost less than two dollars, so it's worth experimenting to see which brand best suits your style. 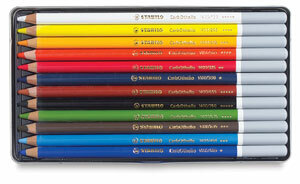 If you're looking for a place to start, Stabilo CarbOthello Pastel Pencils are widely considered to be the best. To see some stunning examples of art created using pastel pencils, check out my interview with pastel pencil artist Colin Bradley. Do you like the texture and versatility of oil paints but hate the smelly chemicals and the many required tools and accessories? If so, you'll love oil pastels. Oil pastels are basically cylindrical sticks of pigment, but they're bound with wax and oil, not gum. This seemingly insignificant difference gives them a distinctive consistency and various properties lacking in other pastel types. The first difference is that oil pastels won't crumble, smudge, or release airborne dust like soft pastels do. Yet they still contain just as much, if not more, pigment and produce bright, intense colors. They're also more stable than soft pastels and don't require a fixative. This makes them great for using on location, but they never completely dry, so safe transport can be a hassle. Oil paints also have a waxy consistency, kind of like crayons, that distinguishes them from soft pastels. They can be spread like oil paint on the support to create strong, buttery strokes. Using oil pastels can be as simple as applying pigment to a sheet of paper with your bare hands. But their versatility allows so much more. You can create impasto effects or thin them with turpentine to create glazes or washes. So why are soft pastels more popular? Oil pastels aren't as good at blending and they aren't compatible with other pastel types. This means that detail work can be somewhat difficult, making oil pastels more suited to larger works. 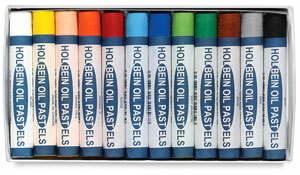 You can buy oil pastels in artists' quality and students' quality, individually or in sets. Manufacturers don't offer nearly as many colors as they do for soft pastels - about 80 - but the range is more than you'll need. If you decide to give oil pastels a try, I'd recommend buying the best you can afford. 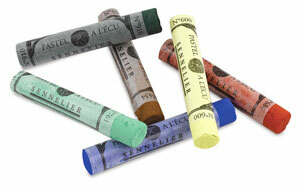 Sets can give you a good starting color palette, but you can begin by simply buying half a dozen artists' quality individual pastels from a reliable brand like Sennelier. They shouldn't break the bank and you'll have an opportunity to become familiar with the medium before you shell out for a wider range of colors. 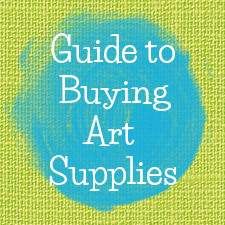 You can check out more art supplies for pastels and other media via the guide to buying art supplies.